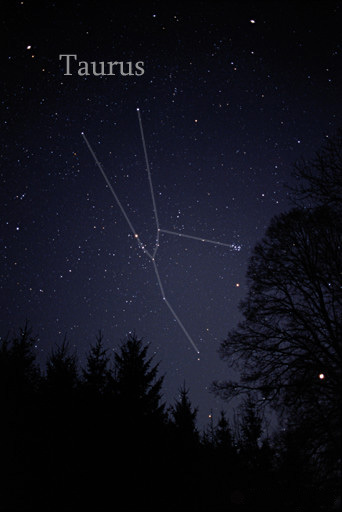 The constellation Taurus, outlined; the V-shape represents the bull's head. The stars in the V are members of the Hyades cluster, except for the bright red star (Aldebaran) which is a nearby red giant. From wikimedia commons. If you’re looking at the sky this evening, you can see the constellation of Taurus the Bull just above the horizon to the east. The bull’s face is outlined by a group of a stars that make up the Hyades cluster, a very near and well-known grouping. The Hyades are an example of an “open cluster,” a group of stars that formed out of the same molecular cloud and are gravitationally bound to each other, but only loosely. The stars in the Hyades are all about 625 (plus or minus 50) million years old – young in an astronomical sense, but older than another well-known open cluster that is also found in Taurus, the Pleiades. This theory paper tries to understand the evolution of the Hyades cluster from formation to the present day. In order to model the history of the stars in the Hyades, you need to track the gravitational interactions of the many stars in the cluster, all of which are moving within the gravitational potential of the Milky Way. First, the authors trace the position of the Hyades cluster back in time to its location within the Milky Way 625 million years ago. From this starting location and with some initial distribution of stars, the authors simulate the evolution of the cluster. Their goal is to find a model for the initial conditions of the Hyades which, after 625 million years of evolution, provides a good fit to the current properties of the cluster. To do this simulation, the authors use an N-body code, which is a tool for modeling the gravitational interactions for many bodies. In this case, it is also important to include stellar evolution: both supernovae and stellar mass loss will influence the evolution of the system. The code used by these authors (a new one, based on the NBODY6 code) includes a prescription for stellar evolution, which includes the formation of stellar remnants (e.g. white dwarfs) and rapid mass loss (from supernovae and planetary nebulae). Supernovae and planetary nebula formation give the associated stellar remnant a velocity kick, where the velocity is drawn randomly from a reasonable distribution. The starting distribution of stars are also drawn randomly from within a model. For each model, the authors run their simulation 15 times and take the average of the final distribution, because the randomly chosen beginning distribution of stars and the random velocity kicks produce slightly different end results. They also try adding binary stars. The final distribution of stars in the Hyades for one model after 625 million years. The long, 800pc tidal tails are the most evident feature. Several reasonable good fits to the observed parameters of the Hyades are obtained. The best fitting model with no binaries started with an initial mass of 1721 solar masses and loses mass at a rate of 2.2 solar masses per million years. Another good fit uses a different model for the initial distribution of stars but includes an initial binary star fraction of 33%; in this case the beginning mass of the cluster is lower (1230 solar masses) and the mass loss rate is also smaller (1.4 solar masses per million years). These two examples illustrate that there are many degeneracies involved due to the large number of variables in this study. Two conclusions the authors do reach are (1) that it is very likely that all stellar mass black holes and neutron stars have been kicked out of the cluster and (2) that the Hyades has tidal tails 800pc long.